Edible Wild Food Blog » Dandelions: Can’t Beat Them So Eat Them! Dandelion flowers are open once again and although these are viewed as a nuisance to some people – they add a cheerful colour to the landscape and are amazingly good for our health. In fact, dandelion greens are sold in most grocery stores nowadays! Some people consider dandelions a weed, yet categorically dandelions are no more a weed than grass. Many corporations have influenced and convinced us over several decades that our lawns must look lush and green, yet this is an ongoing losing battle. The cost of this battle has been polluted groundwater and the use of these chemical sprays has been linked to ill-health effects. Fighting for a perfect lawn is stress that is guaranteed year-after-year. The long and short of grass is that the roots are very shallow; therefore they are unable to grow deep to where the abundance of water and nutrients are. All other weeds have long roots; therefore they remain green, many even through a drought. Fighting the mighty dandelion takes time, energy and for some money (employing companies that eradicate weeds). If you can’t beat them – eat them. So long as your lawn has not been poisoned by chemicals, pick your dandelions – and use them. After all, they are free food and collecting them is a great form of exercise not to mention getting fresh air! Dandelion flowers are not just a source of food; they are known to have medicinal properties. These pretty flowers are an excellent source of lecithin, a nutrient that elevates the brain’s acetylcholine, a substance that helps maintain brain function and may play a role in slowing or even stopping the progression of Alzheimer’s disease. Lecithin helps the body maintain good liver function, so there is no surprise that dandelion is widely recommended by herbalists and naturopathic physicians for liver detoxification. In addition, in a report written to the French Academy of Medicine in 1956, Dr. Remy Chauvin discovered that the dandelion’s pollen had antibacterial effects (helps to prevent boils, skin infections, tuberculosis, edema and promotes blood circulation). Are you now convinced that these “pesky” weeds are nature’s way of saying – free nutritious food for the taking? If so – the culinary world becomes a creative world to enjoy! Here is one recipe that will allow you to enjoy an all-time favourite baked good that is loaded with nutrition: Dandelion Banana Bread (or Muffins) Recipe. Would you mind sharing your Banana & Dandelion Loaf? 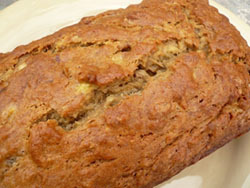 Would you mind sharing your recipe for the Dandelion & Banana Loaf? The link to the recipe is at the bottom of the blog.. ot here!! I hope you enjoy it!!! It sure is tasty! Nice post which The long and short of grass is that the roots are very shallow; therefore they are unable to grow deep to where the abundance of water and nutrients are. All other weeds have long roots; therefore they remain green, many even through a drought. Thanks a lot for posting this article.